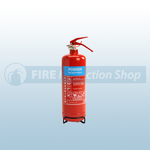 Our FireShield range of Small Fire Extinguishers are widely recognised and trusted, they have become well known for their high quality finish and reliability. Depending on the type of risk you are looking to cover, we have two types of Small Fire Extinguishers that a ideal for a number of applications. Please see below a short desription of what each Fire Extinguisher is capable of fighting. BC Dry Powder Fire Extinguishers: B Class materials such as petrol, oils, paints, flammable liquids and C Class materials such as propane, hydrogen and natural gas. ABC Dry Powder Fire Extinguishers: A Class materials such as wood, cardboard, paper, straw, textiles, coal, sugar, solid plastics, rubber, furniture etc, B Class materials such as petrol, oils, paints, flammable liquids and C Class materials such as propane, hydrogen and natural gas. AFFF Foam Fire Extinguishers: A Class materials such as wood, cardboard, paper, straw, textiles, coal, sugar, solid plastics, rubber, furniture etc, B Class materials such as petrol, oils, paints and flammable liquids. Wet Chemical Fire Extinguishers: A Class materials such as wood, cardboard, paper, straw, textiles, coal, sugar, solid plastics, rubber, furniture etc, B Class materials such as petrol, oils, paints, flammable liquids and F class materials such as cooking oils/fats in cooking appliances.